Disability Access Certificates (DAC’s) in Ireland – Confused ?? 2011-09-01: To say, bluntly, that there is confusion out there … at every level … would be a mild understatement ! Yes, the Disability Access Certificate (DAC) & Revised DAC Process is new … but that cannot explain what is happening … or, more precisely, what is not happening. The definition of People with Disabilities in the existing Part M is limited. It is inadequate. Compare, now, that definition with the definition of Disability in Irish Equality Legislation … which is the complete opposite, being very wide in scope. A deep chasm exists between the two. Check each of them out for yourself ! And because few people are aware of this chasm … a better description of that large space might be a Black Hole. However, the clear consequence of the Black Hole for building owners … and building designers alike … is that the ‘act’ of merely going through the motions with regard to compliance with Part M … and being satisfied with getting ‘the’ piece of paper, i.e. a Disability Access Certificate … will, without any shadow of a doubt, open the building owner to a complaint under Equality Law. And when a building owner encounters this sort of problem … who will he, or she, hunt down for an explanation ?? Client Organizations beware … prevention is a far better strategy !! Check out the Level of Accessibility Performance required to avoid complaints under Equality Legislation. For a sizeable group of vulnerable people in every EU Member State, the sole route of access to many, if not most, of the Human and Social Rights set down in the 1948 Universal Declaration of Human Rights (UDHR) is the UN Convention on the Rights of Persons with Disabilities (CRPD) … which became an International Legal Instrument on 3 May 2008, and was ratified by the European Union on 23 December 2010. That is precisely why Accessibility is such a critical component of the 2006 UN Convention ! Articles 31 & 33 of the 2006 UN Convention on the Rights of Persons with Disabilities – together – mandate that Accessibility Implementation is taken seriously … that it is competent and effective … and, most importantly, that independent monitoring and verification is a fundamental part of the process. Ireland has not yet ratified the UN CRPD. And, as far as our National Authorities Having Jurisdiction (AHJ’s) are concerned … everything in the garden is beautiful … Ireland is doing just great and nothing much needs to be altered in our laws, administrative provisions or resourcing … to allow Ireland to ratify the Convention, and then properly implement it. Nothing could be further from the truth ! In Order to Protect your Organization and its many interests … Your Policy and Decision Makers, in Ireland, should study the implications flowing directly from EU Ratification of the UN CRPD … and then, the various Articles of the UN Convention should be examined and properly implemented … insofar as those Articles are relevant to you and your organization’s activities. See my earlier post, dated 5 February 2011. To date … the quality of Accessibility Implementation in Irish Buildings has been dreadful !! For important reasons … which all parties involved should fully understand … this situation is longer acceptable. Colour photograph showing the front entrances to dwelling units in a New Inner City Housing Scheme in Dublin ... User Unfriendly ... Inaccessible for Many Vulnerable People in Our Society ... Dreadful Accessibility Implementation ! Photograph taken by CJ Walsh. 2003-09-13. Click to enlarge. In the absence of an inspection by the Building Control Authority (BCA) during actual construction … whether or not it is likely that the completed works will match the DAC certified design documentation with regard to Accessibility Performance. From the beginning, it is necessary to distinguish between Access and Accessibility. Safe Movement to a ‘place of safety’ (during, for example, a fire emergency), which is remote from the building. This is also a useful guideline with regard to segregating those aspects of Accessibility Design which relate to Part M: ‘Access for People with Disabilities’ of the Second Schedule to the Irish Building Regulations, and which should be considered in any application for a Disability Access Certificate (DAC) … and those, after ‘and‘ … which relate to Part B: ‘Fire Safety’, and which should be considered in every application for a Fire Safety Certificate (FSC). M1 Adequate provision shall be made to enable people with disabilities to safely and independently access and use a building. 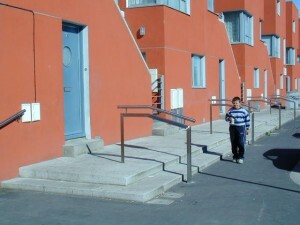 M2 If sanitary conveniences are provided in a building, adequate provision shall be made for people with disabilities. M3 If a building contains fixed seating for audience or spectators, adequate provision shall be made for people with disabilities. M4 In this Part, ‘people with disabilities’ means people who have an impairment of hearing or sight or an impairment which limits their ability to walk, or which restricts them to a wheelchair. My Note 1: In order to safely and independently use a building … it is also necessary, under normal conditions, to use the egress routes of a building. My Note 2: The limited definition of ‘people with disabilities’ in Requirement M4 does not include, for example, a person without arms … or those people with a mental, cognitive or psychological impairment. ” 7. (1) The Minister may publish, or arrange to have published on his behalf, documents to be known as ‘technical guidance documents’ for the purpose of providing guidance with respect to compliance with the requirements of any of the provisions of the Second Schedule. (2) Subject to the provisions of sub-article (3), where works or a building to which these Regulations apply is or are designed and constructed in accordance with any guidance contained in a technical guidance document, this shall, prima facie, indicate compliance with the relevant requirements of these Regulations. My Note 3: Since the introduction of national legal building legislation in the early 1990’s, the Irish Building Regulations have a Functional Format, as required by European Union (EU) Law. In other words, satisfactory compliance with short functional statements is mandated by law … and provided the requirements of those short statements are properly shown to be complied with, it is entirely optional as to which materials, methods of construction, standards and other specifications (including technical specifications) are used. In this way, the free movement of products and services within the EU is facilitated and encouraged while, at the same time, technical barriers to trade are avoided. My Note 4: For the convenience of readers, the short functional statements mandated by law are reproduced, in a shaded box, at the beginning of each of the Technical Guidance Documents. The Guidance Texts in each Technical Guidance Document, however, are not Prescriptive Regulations. These texts are merely an indicator of what is likely to be suitable for the purposes of compliance with the Regulations … they are, prima facie (i.e. on ‘first appearance’ only), an indication of compliance ; they are not ‘deemed-to-satisfy’ the Requirements of Part M.
My Note 5: Where gaps are identified in the guidance texts of Technical Guidance Document M … and in the absence of an Irish National Standard on Building Access or Accessibility … a suggested hierarchy of approach should be to source an appropriate European Standard (EN) or, if such a standard does not yet exist, then an appropriate International Standard (ISO), or then a National Standard of any country which is a contracting party to the Agreement on the European Economic Area (EEA) which provides in use an appropriate level of Access/Accessibility Performance (refer to Part D of the Second Schedule to the Building Regulations). In the unlikely absence of any of the above, an appropriate Design Guidance Document – national or otherwise – should be referenced which provides in use an appropriate level of Access/Accessibility Performance. Our Organization – Sustainable Design International – provides an independent (and confidential) Accessibility Monitoring and Verification Service.